Foodlovers Restaurant Elite is an elegant responsive restaurant HTML5 template with many useful options created by Plentong, and featured at ThemeForest. 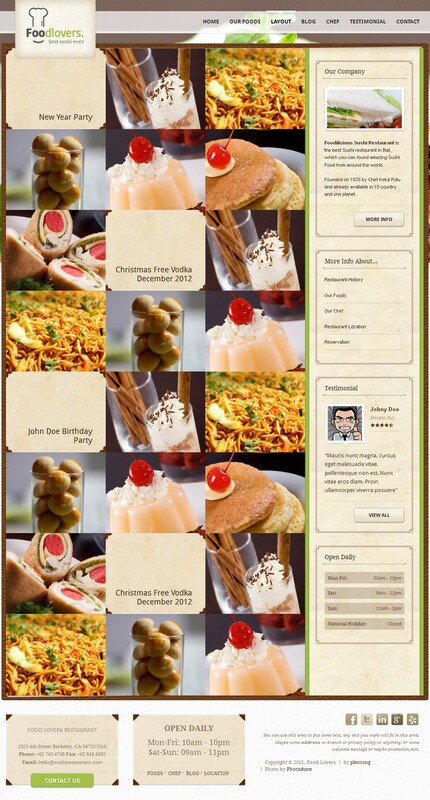 The template features a 2 column layout with jQuery elements, is very adjustable and it can be used for various restaurant niches, as well as for any sort of company profile. It is fully responsive and it’s checked to be working on any kind of different devices, including iPhones and it supports retina display. The homepage features a full width slider where you can post photos of some of your most precious delicacies and have your visitors eyes glued to your tasty meals right away. You can add your working hours right under it for everyone to see your schedule. The layout offers few color variations. 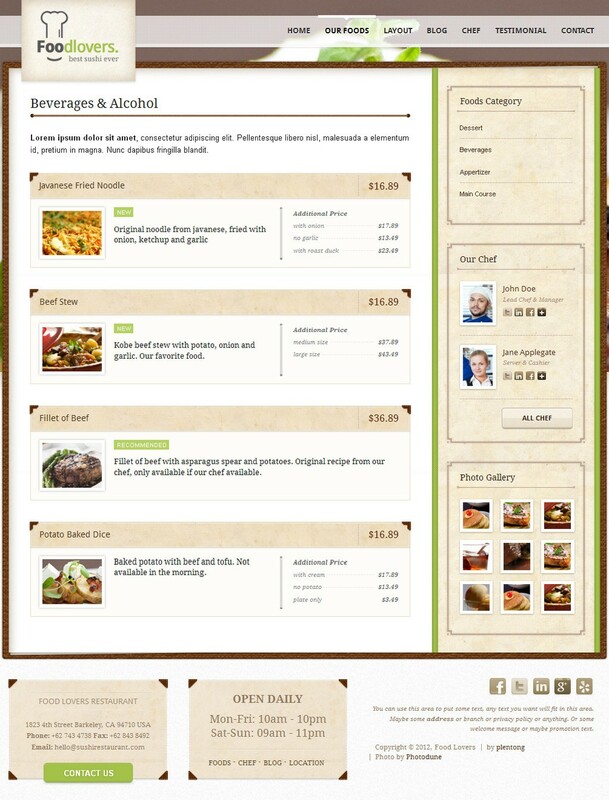 The blog section will allow you to post as much as you want and introduce your visitors to just about any aspect of your restaurant, bringing them closer and keeping them informed about your business. This template features 2 menu styles, and it will be very easy for you to choose which one you like better, and create a nicely organized menu which will look great. You will be able to connect your website to all of the most popular social networks with nice social network icons featured that you can add to your homepage. 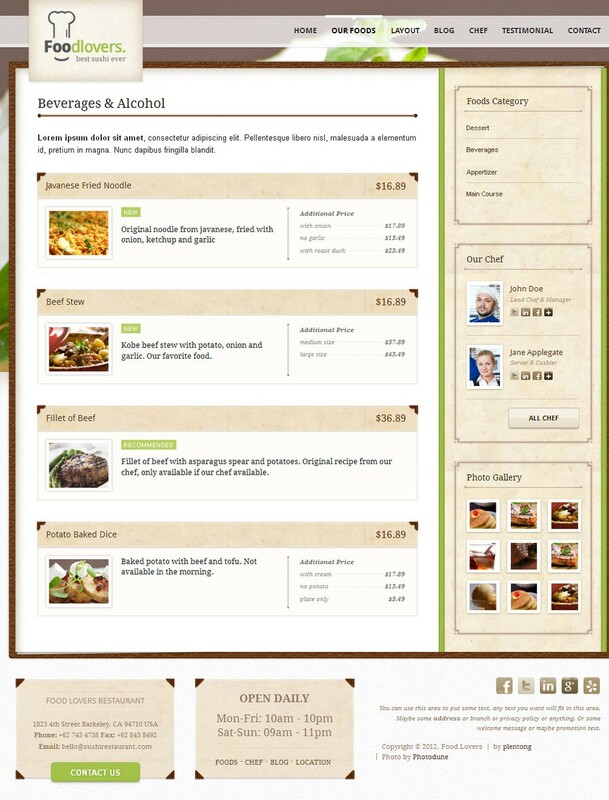 The testimonial section is there for you to post testimonials your satisfied customers left for you, and let everyone see what your guests think of your restaurant. 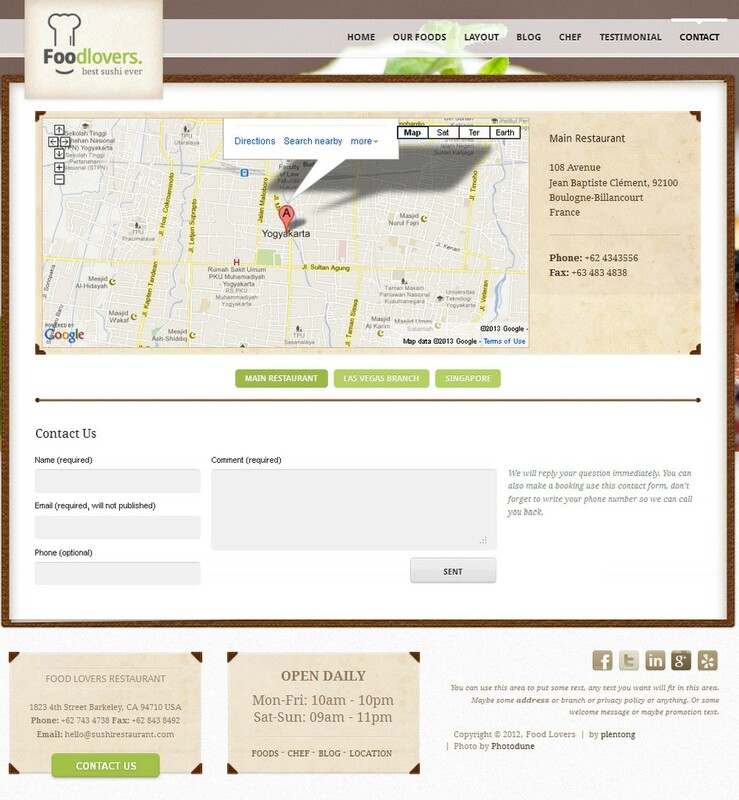 The contact page features Google Maps for everyone to easily find your place by giving exact directions to your restaurant. It also features a nice a nice and simple contact form which can be used for easier interaction with your visitors allowing them to message you any time. 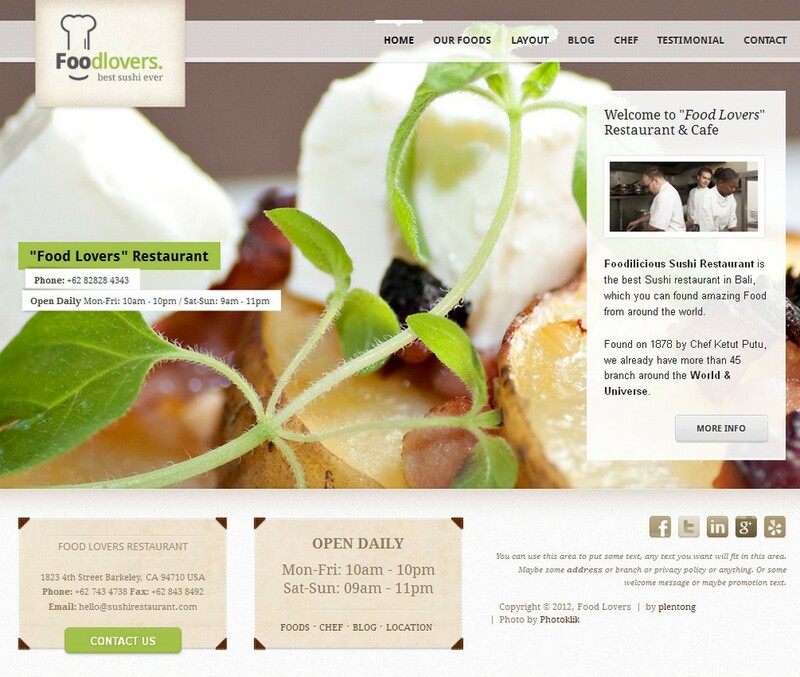 Foodlovers is a very functional, great looking responsive HTML restaurant theme with many customization possibilities and a nice amount of documentation for easy modification. 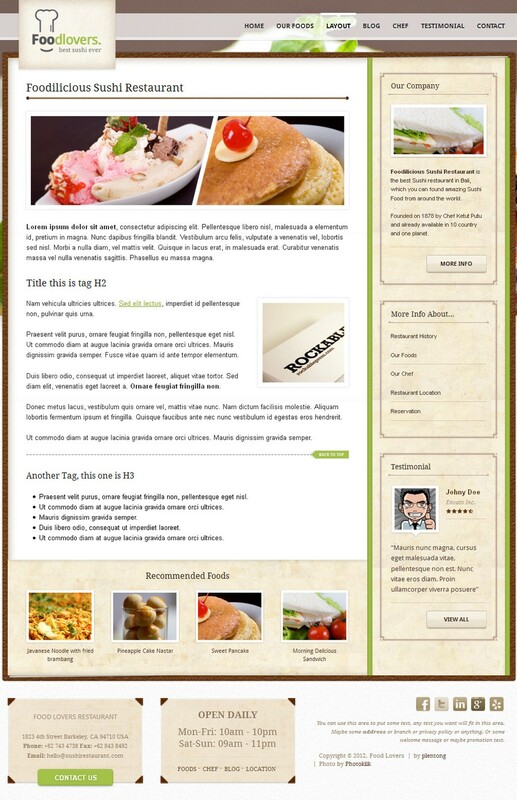 Besides this HTML version you can buy Foodlovers also as a WordPress restaurant theme.